2 bedroom 1 bathroom 1 shower room in peaceful location in the heart of the medieval quarter with a private courtyard garden. This cottage was bought to be my personal bolt hole when visiting England and also a home to share with my friends and family as I am currently living in Fort Lauderdale Florida. I have dual British and American citizenship having moved to the USA 17 years ago. The cottage is my personal pride and joy and it will be a pleasure for me to share it with you. 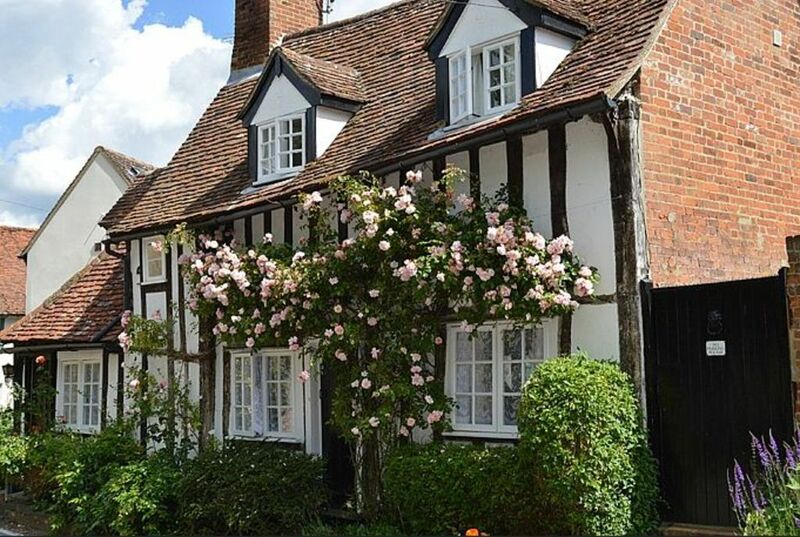 I fell in love with the cottage in 2012 while visiting Saffron Walden; it was so pretty with roses around the door and only a 5 minute walk from the town's restaurants and shops. I had lived in Saffron Walden before moving to Chicago, USA in 1999 and now live in Fort Lauderdale , Florida. I am very happy to have bought the cottage with a view to my husband and I retiring there in a few years time. I love Saffron Walden with its historic centre and market place and the cottage's location, though in a very quiet street, is only a few minutes from the shops, market place, pubs and restaurants making it unnecessary to drive anywhere when in town. The cottage is only 25 minutes drive from the centre of Cambridge and a 45 minute train ride to the London Underground. If you are looking for a romantic period cottage to spend a week or weekend this cottage is an ideal match. 15th century charm with brand new plumbing, kitchen and bathrooms. It's location between Cambridge and London make it an ideal base for visiting the UK as the Audley End train station with its regular service to both cities is a 10 minute drive away making it unnecessary to drive into the cities. It is also perfectly situated for touring the East Anglia area including Suffolk and Norfolk. The cottage oozes character from every beam and has a very warm and welcoming atmosphere. Audley End Park is only a 5 minute walk away from the cottage meaning you can enjoy the English countryside as well as all that the town itself offers. Bathroom comprises bath with hand shower attachment, wc and basin. En-suite has shower, basin and wc. Both bathrooms have heated towel rails and electric shaver points All bathroom fittings were installed in 2013. The cottage has gas central heating and each room has it's own radiator. The temperature can be adjusted by a one touch control.The bathrooms also have heated towel rails.Kitchen has underfloor heat. We use John Lewis Antique bedding with lace trim & ladder stitching. it is 100% Egyptian Cotton 200 thread count. The cottage has a 2016 model Bosch washer dryer -instructions provided. The cottage has a Bosch washer/dryer which can dry small loads of washing. There is also a washing line in the courtyard to allow for outside drying. An airing rack can also be provided on request. The cottage has two inglenook fireplaces equipped with very realistic electric wood burning stoves. Each fireplace is also equipped with artificial candles to enhance the ambience. Towels are Christy Luxe towels in crisp, clean white. Made with 100% Turkish cotton, with a weight of 730 GSM, smooth and absorbent which bring a spa feel to the cottage's bathrooms. Sitting room with sofa bed and two occasional chairs, occasional tables and is equipped with TV, DVD player and cable tv. The inglenook is equipped with a realistic electric wood burning stove. Kitchen has been refitted in 2013 with brand new appliances to include cooker, hob, fridge, freezer, washer/dryer and microwave. Granite work surfaces. The dining table can be left out to accommodate 6 people and a highchair or it can be folded down to accommodate 4 people. There is one television in the sitting room. The cottage is equipped with BT cable tv. The DVD player is built into the television. The cottage has a small library of local history books and guides plus a collection of children's books with a theme of ducks and drakes - what else? There are also several cookery books. The sitting room coffee table contains an assortment of popular games plus a pack of cards and dominoes. The cottage has a small but very private courtyard garden comprising a patio area with adjacent C shaped borders with roses and small shrubs. It is equipped with table, 4 chairs, parasol and BBQ. Outside: Property has a small private courtyard garden with outdoor table and seating for six. Barbecue available. Courtyard has garden border which is heavily planted. Cleaning / Towels / Linen / Maid service: Towels and linens are included with weekly cleaning and change of linens. Other: Dining room has an extendable dining table with seating for 6 and is open plan to the kitchen. Inglenook fireplace with electric fire. Railway station Audley End 2 miles - travel time to London , Liverpool Street 1 hour. M11 access within 3 miles. Cambridge 15 miles, London 40 miles, Audley End House and Garden 3 miles. Saffron Walden Town Trail, Museum and Castle 200m. Fry Art Gallery and Bridge End Gardens two minutes walk away. Several public houses, restaurants and local shops in easy walking distance including post office and tourist information. A post office, several banks and supermarket are within 10 minutes walk.